The chef should be the soul of any omakase-driven restaurant (“omakase” is Japanese for chef’s choice). And at the recently opened Sushi Dokoro Hikari, the soul is embodied in none other than Andy Li – the former chef of Xenri no Tsuki in Causeway Bay’s Henry House. While Li was known for his artistically crafted kaiseki dishes at his former digs, he’s since traded in for a less dramatic menu at this cosy neighbourhood sushi spot in Tin Hau. 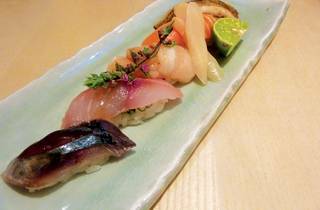 Though Li continues to offer some of the freshest, seasonal ingredients at the new restaurant, the food veers on the safe and somewhat predictable side, making it difficult to distinguish from most other high-end Japanese joints in town. Two omakase options are available from the dinner menu, priced at $480 and $680 each. The former, capping in at seven courses, kicks off with a selection of small homestyle appetisers. On the night we visited, we were treated to pickled cucumbers with clams, perked up deliciously with small flecks of red chillies, as well as a small dish of simmered, tender pork. The deep-fried homemade tofu served in broth is less enthralling with a slight grainy texture that breaks apart all too easily. Next to arrive at the table is the chef’s selection of sashimi served over ice, including botan ebi with pearly sweet flesh, scallops and seasonal yellowtail. More interesting though is the sushi selection, which arrives already seasoned without the need for additional soy sauce or condiments. The anago (conger eel) nigiri is exceptional with a soft, almost pillowy quality that’s filmed under a carefully flavoured soy sauce reduction. A piece of hotate (scallop) is plump and sweet, followed by a sliver of aji (horse mackerel) and a deliciously firm isaki (chicken grunt) resting over sliced green scallions. Aside from the impeccably fresh pieces of seafood (all chosen at the peak of their season), the nigiri base also deserves special mention. The subtly vinegared grains are packed so well that it keeps its shape when picked up, but falls apart delicately when consumed. 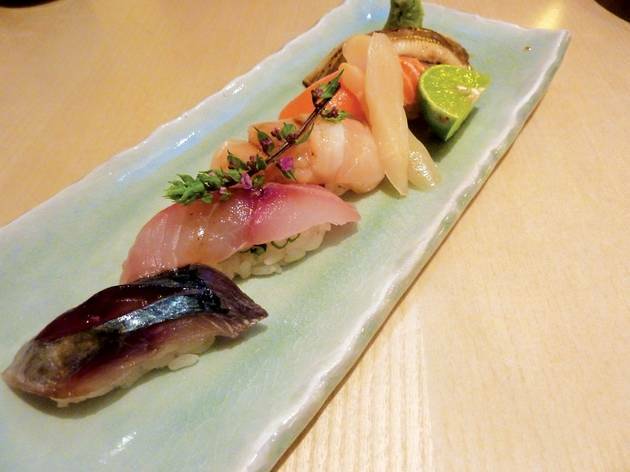 Following the interlude of raw seafood, the remainder of the omakase course follows a predictable path. A serving of well-executed tempura comes with a pale yellow batter that gently coats the prawns, sweet potatoes and pumpkin. The grilled course consists of thin slices of yakiniku beef served in a runny teriyaki sauce. The savoury meal finally ends with a bowl of slippery udon served in a clear, umami broth simmered with prawn shells before leading into the daily selection of ice cream (green tea and coconut on the night of our meal). 4 Lau Li St, Tin Hau, 2566 3801. Mon-Sat noon-3pm, 6pm-11pm & Sun noon-3.30pm, 6pm-11.30pm. Dinner for two: around $1,000.